I've been thinking about this for a while and I agree with Jane Goodall that there is hope and it is never too late but everyone needs to start having that mentality if we do want to make a difference. People are so negative about they environment when they should start being positive. I think that instead of saying how much humans have destroyed the planet we should say that humans really make the planet beautiful in their own way. In certain ways humans are to blame for destroying the planet but I don’t think that most humans were aware that they were. I think that humans thought that with technology that we were improving the planet. However, now that humans have been educated I think we realize that not all technology is beneficial now. I think that environmentalists should try to take a more positive approach to the issue rather than shame the people who are less educated about the earth and the destruction humans have caused. What I’m trying to say is that not all people have the opportunity to take a colloquium class and learn about all these things and I do think that needs to be taken into consideration. Animals have killed people before, so I completely understand why humans kill them out of fear. If I were in a situation where I felt harmed by an animal I would probably kill it too. However, humans can’t use fear as an excuse to kill animals for food, or poaching or anything that kills animals for the wrong reasons. The relationship between Jane Goodall and the apes taught me that humans and animals can live in peace and humans don’t have to kill animals for food, fun or any other reason. There is hope for this planet. We can find ways to restore the earth to its natural beauty. We haven’t destroyed it yet; we still have wildlife, nature, and our health. We just need to take steps in the right direction and help reduce of ecological footprint. Coming together is the first step in a very important process. Without hope, none of it will be possible. There is still hope, and I believe its our individual responsibility to find out what gives us hope. The teaching by Goodall fits into our courses learning outcomes because our goal is to have intelligent conversations about nature, life and everything that comes with that. Jane Goodall is saving the chimpanzees and that’s something we can all talk about. 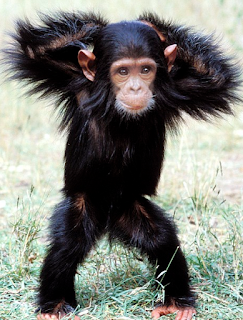 Yes, a chimpanzee is just one type of animal, however, it is a foundation for the beginning of a movement. Once we find out what gives us hope, maybe we can choose our own animals to talk about. We can find reasons why that animal is beautiful and why we need to protect this earth so all animals can live a healthy and beautiful life. I don’t want to live in a world where animals don’t exist. The world is not just for humans, we need to love all types of life and we need to start by loving the earth that we all inhabit and share.